Filice, Michelle. "Treaty 4". The Canadian Encyclopedia, 01 February 2018, Historica Canada. https://www.thecanadianencyclopedia.ca/en/article/treaty-4. Accessed 24 April 2019. By 1873, western settlement and the disappearance of the buffalo — on which the early economies of many Plains Indigenous peoples depended (see Buffalo Hunt) — threatened First Nations populations in western Canada. As a means of protecting their land and livelihood, the Indigenous peoples sought treaties with the federal government. However, since Treaties 1, 2 and 3 had already provided for settlement and a transportation route to the western interior, the government did not feel compelled to negotiate any more treaties with western First Nations. 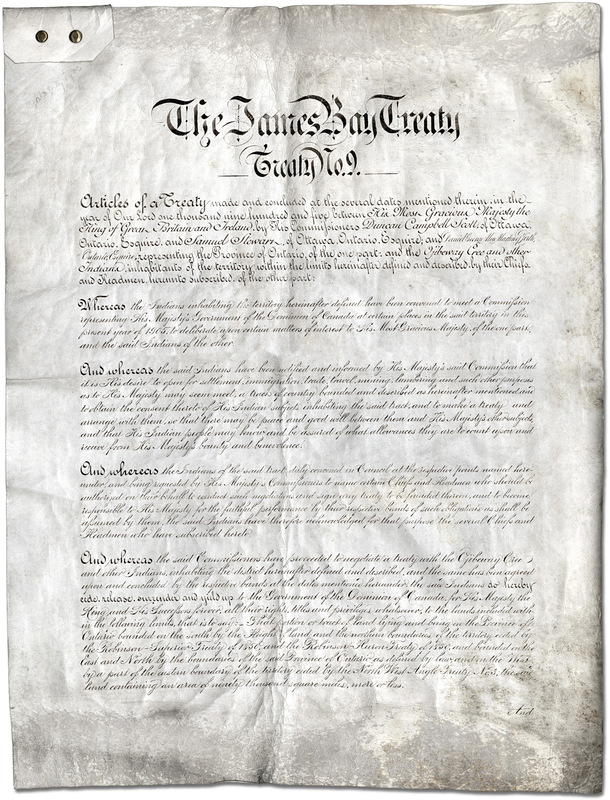 Despite the federal government’s disinterest, lieutenant-governor of Manitoba and the North-West Territories, Alexander Morris, believed that making additional treaties would bring stability to the West (see Numbered Treaties). Increasing encroachment on Indigenous territories by settlers, Métis peoples, illegal whiskey traders from the United States and the survey parties of the Canada–United States Boundary Commission and Hudson’s Bay Company (HBC) caused friction with the First Nations living there. These problems, coupled with the end of the buffalo hunt and the fear of starvation, strained intertribal relations, particularly between the Kainai and the Cree, who fought the last major conflict between First Nations in Canada at the Battle of the Belly River in 1870. Shortly after Alexander Mackenzie became prime minister, Morris wrote to the minister of the Interior, David Laird, telling him about his idea to sign a treaty with the Cree, Saulteaux bands of the Ojibwa peoples and the Assiniboine living in the Qu’Appelle region, between Fort Ellice and the forks of the Saskatchewan River. 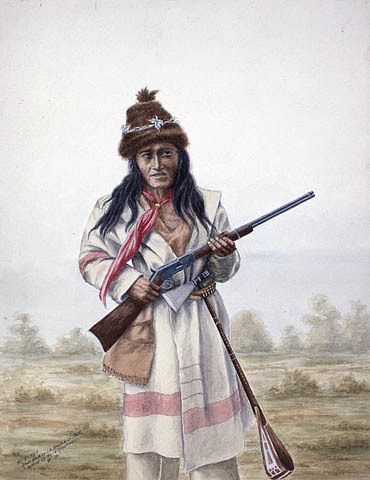 The government agreed to negotiate a treaty; and by mid-May 1874, Morris learned that the Indigenous peoples of the Qu’Appelle area were also ready to negotiate. Morris was selected as the senior negotiator, and was accompanied by Laird and a former HBC worker, William J. Christie. The three commissioners arrived at Fort Qu'Appelle on 8 September 1874. Treaty negotiations got off to a rocky start, as the Cree, Saulteaux and Assiniboine were somewhat divided along tribal lines, and therefore had difficulty selecting a main spokesperson and agreeing on treaty terms. While some headmen like The Gambler (Saulteaux) were hesitant to negotiate and skeptical of the government’s promises, others, such as Plains Cree chief Loud Voice were more optimistic and believed that a treaty would benefit their people. In addition to dissention, the commissioners were bothered that less than half of the First Nations in the area attended the meeting on the 8 September. This was because many of them were away buffalo hunting. Since the commissioners wanted to address the entire population, Morris begrudgingly agreed to delay the negotiations until 11 September. On that day, the Cree were ready to negotiate, but the Saulteaux sent word that they would only meet with the commissioners at the Saulteaux camp. The commissioners refused to move camps. The Saulteaux objected to the commissioners’ meeting place because it was located on an HBC post. According to many Saulteaux chiefs, the HBC had stolen their land in the past. Consequently, the Saulteaux felt as though they could not speak freely at the HBC post and refused to meet there. The Saulteaux tried to prevent the Cree from meeting the commissioners, going so far as to cut down one of the Cree chief’s tents. Seeking a peaceful resolution, the commissioners eventually compromised by moving the meeting place closer to the Saulteaux camp. Before negotiations completely broke down, Loud Voice asked that the chiefs come together in unity. Morris seconded this view, warning the chiefs that if they did not make a treaty now, it would be unlikely that the government would negotiate another in the near future. The commissioners and Indigenous leaders then parted ways and met again the following day. On the last day of negotiations, 14 September, the chiefs were ready to negotiate the treaty, but wanted some assurance that the government’s intentions were good. As spokesperson Kamooses asked, “Is it true that my child will not be troubled for what you are bringing him?” Morris assured him that “the Queen’s power will be around him.” The chiefs understood this to mean that the Crown would protect and provide for them for always. Although there were some disagreements among the bands about treaty terms, the leaders were willing to accept the same terms offered in Treaty 3. The commissioners agreed to this. The Indigenous peoples also asked for an annual payment of $15 per person and for the government to clear their debts to the HBC. These requests were refused. After the treaty terms had been translated and explained to the Indigenous peoples, Treaty 4 was signed by the commissioners and 13 chiefs on 15 September 1874. Once Treaty 4 was signed, Morris and Laird travelled to Fort Ellice to meet with a Saulteaux band there that had not come to the meeting place at Qu'Appelle. Their territory straddled Treaty 4 and 2 lands, but they were never included in Treaty 2. Since the terms of Treaty 4 were more favourable to those of Treaty 2, this band chose to be included in Treaty 4. Commissioners continued to make adhesions into 1875 with six more Saulteaux and Assiniboine tribes. These were tribes who either could not make it to the meeting in Qu’Appelle or had not initially accepted the treaty terms. 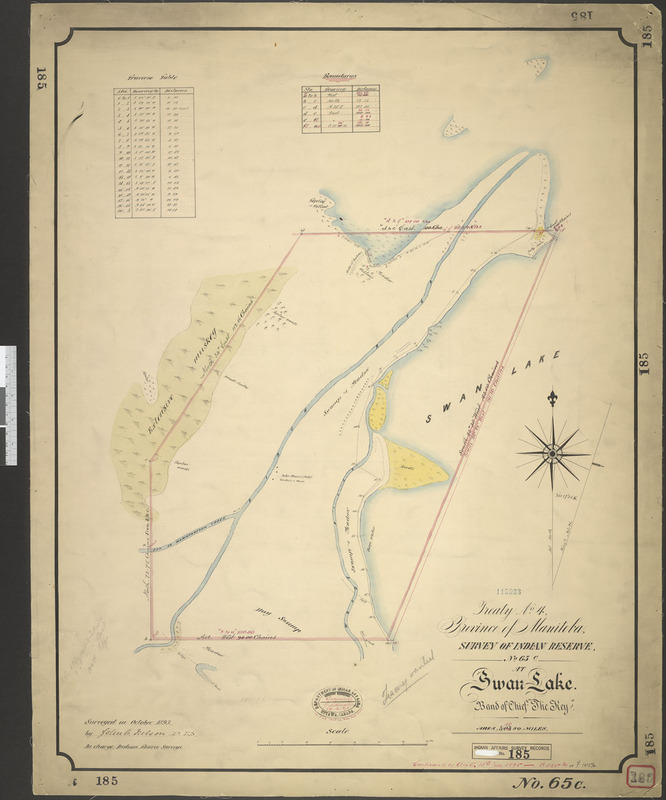 Treaty 4, Province of Manitoba, survey of reserve No. 65C at Swan Lake. Band of Chief The Key. The provisions of Treaty 4 are essentially the same as those of Treaty 3. There were only minor differences concerning the amount of monies, presents and supplies offered. According to the terms of Treaty 4, each person was to receive an annual payment of $5 and a gift of clothing. Chiefs were to receive $25 annually, in addition to a one-time $25 payment, a coat and a silver medal. Every three years, chiefs and band leaders were to receive new clothing. Four leaders per band were also to receive $15 a year. Each family of five was to receive one square mile (640 acres) of land, which they could sell back to the government for compensation. In addition, the treaty provided for farming tools, ammunition, reserves and schools. It also guaranteed Indigenous rights to hunt, fish and trap on all ceded land, except for that land which was to be used for agriculture, forestry, mining or settlement. Piapot (Payepot) lived in the Qu'Appelle Valley, SK. He is well known for leading his people in the last major inter-tribal engagement between the Cree and the Blackfoot on the Oldman River, AB, in 1870. Piapot also signed an adhesion to Treaty 4 in 1875, but many of the terms he believed he had negotiated would not appear until Treaty 6. He died on his reserve in 1908. The Indigenous signatories of Treaty 4 did not receive all that they were promised right away. The reserve selection process only began in 1876 — two years after signing — which, in turn, also delayed their ability to farm. There was also some confusion and disappointment surrounding the terms of the treaty. Cree Chief Piapot, for example, argued that the treaty should also provide for farm instruction, medicine, gristmills, stores, blacksmiths and farm machinery. Piapot believed that his people had been cheated by the original terms of the treaty. Seeking to achieve these demands, Treaty 4 peoples delayed taking their annual payments in 1875 for four days. The terms of Treaty 4 were never expanded, however. Another problem concerned settlement on an area known as the Treaty Ground — a place which was to be set aside to conduct treaty business. It was also the site where Treaty 4 was signed and where the Indigenous peoples received their annual payments. In 1882, Treaty 4 peoples were told to receive their payments on their reserves instead of on the Ground. Although this decision was met with resistance, Indian Affairs disbanded the area and transferred the Treaty Ground to the Department of the Interior in 1894. It took just over a century for Treaty 4 peoples to get this land back. On 14 September 1995, the federal government awarded Treaty 4 peoples $6.6 million, and permitted the purchase of land up to 1,300 acres (526.09 hectares) within a 10 km radius of the Treaty Grounds, which could be converted to reserves. The settlement made possible the construction of a governance centre, archive, cultural organization and office spaces. Some historians and descendants of the Treaty 4 signatories have argued that, due to cultural and linguistic differences, as well as varying views about land ownership, the signatories of Treaty 4 had a different interpretation of the treaty terms than the commissioners. Modern interpretations of the treaty also argue that lack of legal counsel and the hastiness of commissioners to finalize the deal left the Indigenous signatories with relatively little bargaining power. In Elders’ Interpretations of Treaty 4 — A Report on the Treaty Interpretation Project (1986), the Federation of Saskatchewan Indians (now Federation of Sovereign Indigenous Nations) argued that their ancestors did not intend to permanently cede their land. Rather, the Treaty 4 signatories bargained for concessions, assistance to develop and prosper and protections from the Crown in exchange for the use of their land and resources. The Crown’s promise to protect and assist First Nations, they claim, was intended to be a continuous responsibility. However, the elders argue that their ancestors intended to retain the right to self-govern. Treaty 4 First Nations, much like many of the other Indigenous nations of the Numbered Treaties, believe that the treaties should be interpreted in a modern context. For example, the promise of reserve schools and assistance to develop the land should translate into access to modern education and economic assistance. Treaty 4 includes 35 First Nations, who live in parts of southern Saskatchewan and Alberta, and western Manitoba. There is no one political or administrative organization that represents all Treaty 4 peoples. However, there are other organizations that serve Treaty 4 peoples, such as the File Hills Qu’Appelle Tribal Council (which represents 11 Treaty 4 First Nations), the Southeast Treaty #4 Tribal Council (which represents two Treaty 4 First Nations) and the Treaty 4 Education Alliance (which serves the education needs of 12 First Nations). Treaty 4 First Nations continue to protect and preserve Indigenous rights to the land, as well as to pursue education and economic development. In 1999, 30 chiefs of Treaty 4 First Nations signed an agreement-in-principle for self-government. 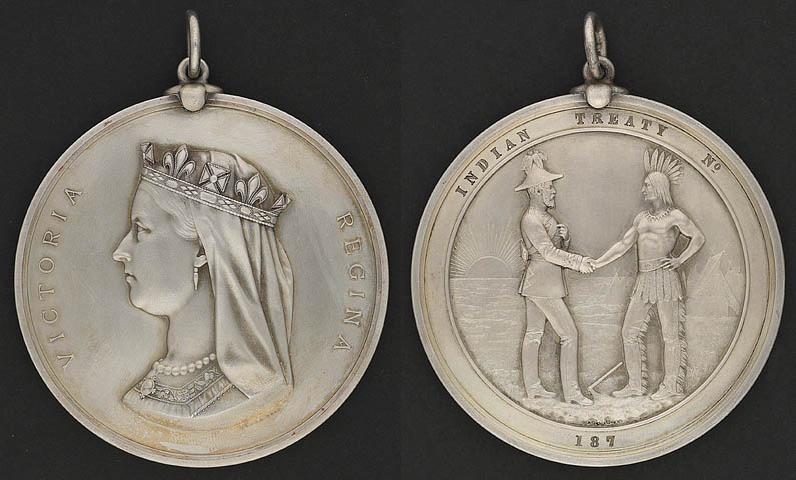 Alexander Morris, The Treaties of Canada with the Indians of Manitoba and the North-West Territories (1880). Robert J. Talbot, Negotiating the Numbered Treaties: An Intellectual and Political Biography of Alexander Morris (2009). Jill St. Germain, Indian Treaty-Making Policy in the United States and Canada, 1867–77 (2011). Michael Asch, ed., Aboriginal and Treaty Rights in Canada (2011). Michael Asch, On Being Here to Stay: Treaties and Aboriginal Rights in Canada (2014).